Apollo 13 was the seventh manned mission in the American Apollo space program and the third intended to land on the Moon, but the lunar landing was aborted after an oxygen tank exploded two days later. With this game your mission is to orbit in the deep space as long time as you can. Like the real Apollo 13 mission, you need to use the planets gravity. If you don’t get near the planets gravitation then you will fly into the deep dark space. Be aware of the meteors and u.f.o’s flying around. How many planets can you orbit before you die? “Wowww i like this game so much, im playing it for all the whole time . I also suggested it to my kids and my friends and seeing who can make more scores. 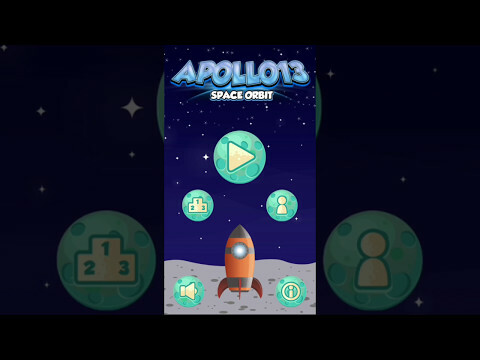 Its great orbit game , if you like these kind of games , this is what you need to have . Try it and play it …” App Store Review. “Downloaded this app a few days ago. I realize that this game is very challenging because the mission in this game is go orbit in the deep space as long time as you can, the longer you survive the different and special things will be appear. Besides, user friendly allow me to easily get familiar with those function key and control the game. Love this game so much!! !” App Store Review. “Fun and addictive game, gameplay is very simple to learn. Recommended for anyone who wants a game to play to pass time.”​ App Store Review. Rocket 1 is the main rocket you start the game with. You can buy the other rockets with the coins you collect. These are the enemies you don’t want to hit, while you are orbiting.